After weeks of skirting tensions in the Southern Ocean, the pressure between activists and Japanese whalers has finally come to a head. A Japanese vessel named the Yushin Maru No. 2 collided with the Bob Barker, according to AP. Protest group Sea Shepherd said the whaling vessels got too close to their ships and crashed into their boat, the Bob Barker. Japan says the Bob Barker got too close to their whaling ship. Sea Shepherd said the Bob Barker's bow and anchor were damaged, and Japan said their ship received damage to a railing and its hull. Sea Shepherd has released this footage of the crash. 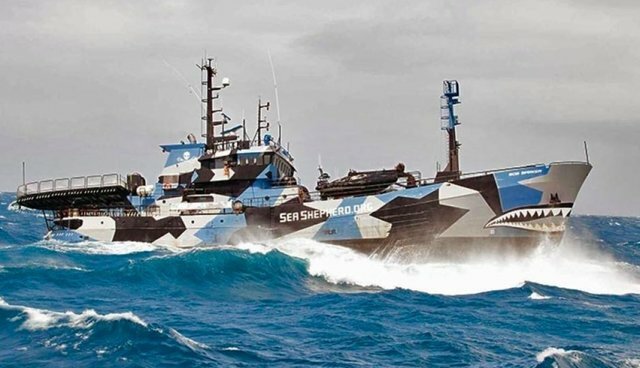 "The assault is an attempt to deter the Sea Shepherd ships from their current position, blocking the slipway of the Nisshin Maru, preventing the whalers from loading whales poached from the southern ocean whale sanctuary," said Sea Shepherd in a statement. Bob Barker captain Peter Hammarstedt said his ship was "unprovokedly attacked," according to the Australian news organization ABC. "Certainly the whalers were more aggressive than we have ever seen them before and I think we're quite lucky that nobody was hurt." Australia's environment minister, Greg Hunt, has said that an investigation of the incident will be conducted. "Nobody can play any games with international maritime law everyone must abide by the law and of course if there is evidence that either party has breached international maritime law we will raise it," he said.